I walk into a backyard scene straight out of a 1990’s family comedy, something Netflix would recommend because you liked “Beethoven” and “Cheaper by the Dozen.” Two kids are jumping on a large trampoline while a third child sprays them with the garden hose. Water is getting everywhere. More children are running around – I’m not sure how many because they’re moving too fast. There’s a zip-line strung between two trees, and dog poop all over the yard. A small, homemade skateboard ramp built from mismatched pieces of wood is nailed directly into the patio. As I step off the deck, I see an eight year old boy approach an older woman. He’s shirtless and his arms are covered in marker, with a unibrow drawn on his face. I don’t notice this at first though, because there is a deep red chunky substance covering his legs up to the knees. He looks like he’s been wading around in a pool of internal organs. Eventually Arik walks out from the detached garage to greet me. He’s my couchsurfing host, though this isn’t his house. His house is a three minute drive away, where I’ve just come from. This is Karen’s house, and these are mostly Karen’s kids. She was the first host in Rapid City I contacted about housing, but she was already having several travelers come through that month and she tries to give the kids a few days every week without someone new sleeping in their home. Arik was the next person I contacted, not realizing that he and Karen are sweet on each other, and have been for some time. Karen pops out of the garage before too long. Both she and Arik are young, at least at heart, since they don’t seem old enough to each have kids as old as theirs are. I never learn much about the other birth parents of any of the children. It feels a bit rude to bring it up and Karen and Arik don’t seem particularly interested in explaining. Arik takes me back into the garage to see the cause of the young boy’s bloody legs. 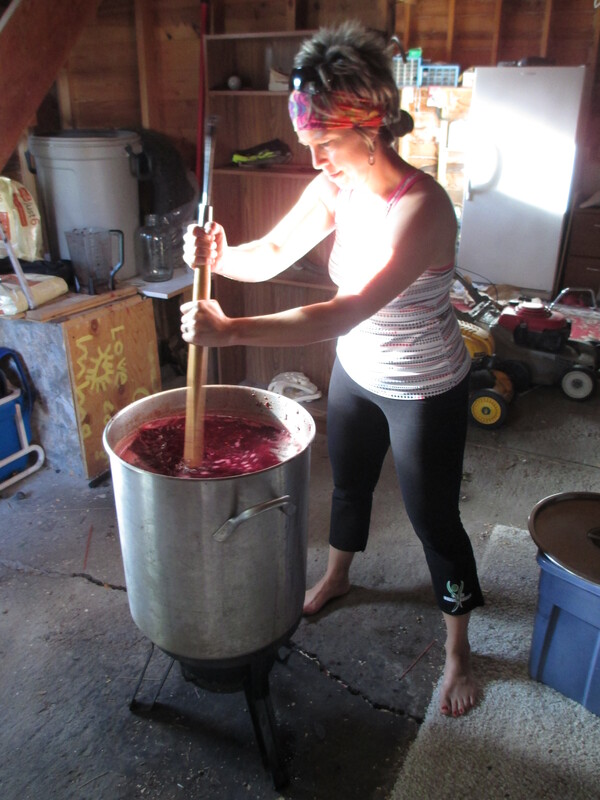 They’re making homemade choke cherry jelly, and the kid wanted to stomp the cherries like wine grapes. Karen assures me that they washed his legs and feet before doing it. The pot they are using is huge, and they’re stirring it with the handle of a garden hoe for lack of a four-foot spoon. I’m introduced to a friend of Karen’s who is stirring the pot. Most of the other kids running around belong to her. Once the smashed cherry goop comes to a boil there’s nothing to do but wait. The friend gives her goodbyes, and Karen, Arik and I sit at a picnic table as the remaining children continue to run around the yard playing. Every ten minutes an alarm goes off, signaling one of us to get up and stir the cherry pot. At the table we talk about couchsurfing and world traveling, two topics I often discuss with hosts. During our conversation the oldest boy (who’s probably around 12 or 13) is practicing a twist maneuver on the edge of the skateboard ramp. The eight year old walks up behind his mom and grabs her beer, flinging it back in a high, fast swig. He slams it down on the table and walks off, and all three of us look at the beer as it foams up to the rim with bubbles. “You gotta teach that kid how to drink a beer,” Arik says. “I know,” she replies with a sigh. “We talked about it the other day, but …” Her voice trails off in that distinctive way parents have when they’ve acknowledged the futility of instructing the young. We wait too long after one of the alarms, and the bottom of the cherry pot burns. Arik starts to worry that we’ve ruined the whole pot of jelly. We grab spoons from the kitchen and everyone has a taste, but no one can say for sure. Choke cherries are bitter, and it’s hard to tell if the flavor we’re sensing is bitter or burnt. To be safe we decide to empty the pot and clean off the burnt bits of the bottom. We help Arik with the arduous task of emptying several gallons of boiling jelly into a giant rubbermaid container so he can give the pot a thorough cleaning. While Arik works, Karen and I go into the kitchen so she can clean up the remains of the family dinner. The stereo in the living room starts playing the Avett Brothers. “You swept me away,” she sings sweetly along as she glides from one thing to the next. She tells me about her mother Mary, and how she’s trying to get Mary to change some of her eating habits. Occasionally kids run through the kitchen. None of them ever stop, except to pick up a quick snack. People tend to have the most interesting opinions about food, even when they don’t think they do. In fact, especially when they don’t think they do. I keep talking to Karen about her nutritional values, and she explains how they never have white sugar in the house, because her family doesn’t need it. She gets some raw brown sugar from the co-op for guests to use in their coffee, but that’s it. I combine the books with the other evidence to create a fuller picture of Karen. She’s very happy to be a mother, and considers it an important part of who she is. She thinks her job as parent is one that ought to be approached purposefully and with knowledge. But she also doesn’t restrict herself to modern science and traditions. She’s interested in what is natural and what feels right. She’s looking for wisdom, not just intelligence. Her youngest, an adorable girl around five years old, comes into the kitchen. She’s curious and self-motivated like her older brothers, but so quiet I often forget she’s there. Without words she informs her mother than she would like to be lifted up and put in a nearby cardboard box, where she proceeds to play games on her mom’s phone. The box is tall and skinny, and Karen has to use her foot to prop it up against the counter to keep the little girl front falling flat on her face. 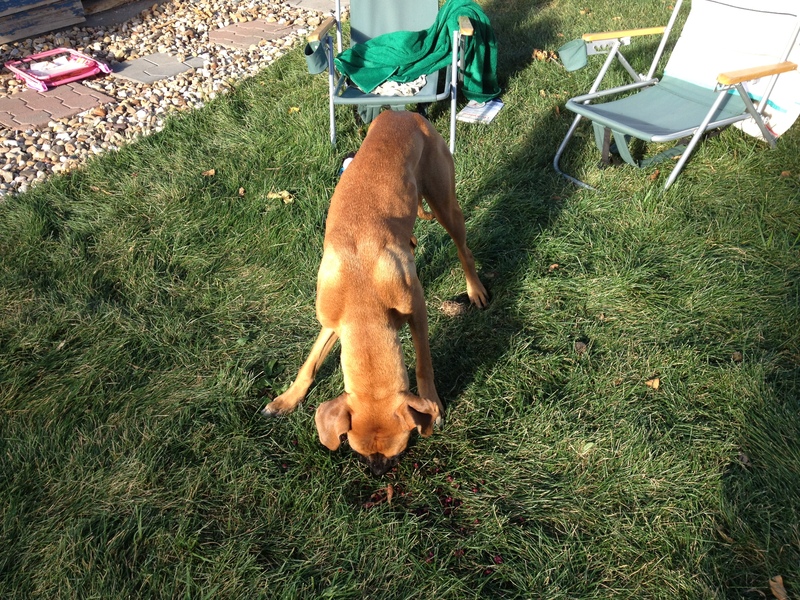 Outside Arik has cleaned out the pot, and bits of burnt jelly are strewn about the yard. The dog starts to eat them. “He’s gonna get the shits,” Arik says. No one intervenes. At the end of the night I say my goodbyes and head back to Arik’s house. He’s opted to stay with Karen and the kids, and it’s probably for the best. Arik’s house only has one bedroom and it belongs to his teenage daughter. Arik’s bed is in the living room, partially blocked by a screen. I sleep a few feet away on a bed that’s been pushed up against the front door, blocking it completely. The screen door in the back is the only way in and out of Arik’s house. This works out well for the house’s other occupants, Buddy and Mama Katt, who can come and go as they please. Mama Katt is fluffy and insists on rubbing against everything I own. Buddy is a shorthair and seems absolutely unconcerned with the intruder in his home. I spend the next day exploring the Black Hills on my own. I’m only home for an hour when I get a call from Arik inviting me over for pizza back at Karen’s house. 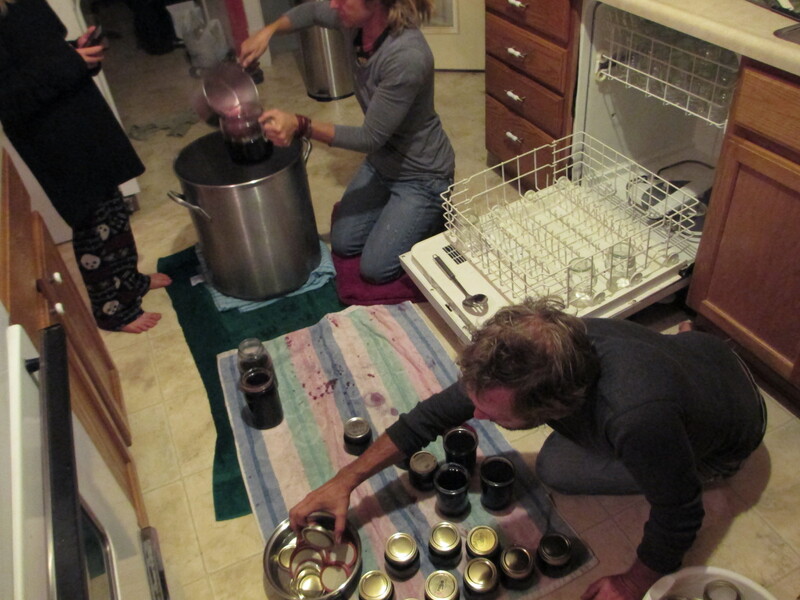 After dinner I help them process the 120 individual jars of choke cherry jelly that they’ve spent the last 48 hours making, and we talk about how Arik might sell them at a local farmer’s market. One of the boys runs around the back yard acting like a ninja, but he has a tough time being sneaky. The dog has a particular aversion to the boy’s mask, and it follows him around, barking and trying to pull the thing off of him. After another long night of good conversation, Karen says she’s ready to go to sleep. It’s clear to me that the older kids are all still up and running around, and Karen tells me that they don’t have a bedtime. They are responsible for managing their own time. Karen home-schools all her children, so they don’t have to be ready to go at 8AM every morning, they just have to get their work done on time. I say my goodbyes as Karen and Arik head for bed. The boys are playing games in the living room. Arik, Karen, and their kids are living lives that might seem slightly outside the social norm. To a certain extent, this behavior is praised. We love to hear about entrepreneurs and artists and other great people who throw off the shackles of mediocrity and go against the grain. But we only like it when they deviate in one specific way, not in a million tiny ones. Each individual step away from societal norms is reasonable, it’s only when a person tries to do too many at the same time that we call them crazy. Of course in some respects they’re just as ordinary as the rest of us. They have kids and houses like most adults. The kids skateboard and play video games like most kids. With a different measuring stick, I become the crazy one. I’m the one who doesn’t plan to settle down and start a family, the one who isn’t really interested in owning a home. We’re all our own kind of crazy. They may be the ones welcoming strangers into their homes, but I’m the one sleeping with strangers. Of course, I’m also drinking that non-fat crap they sell at the grocery store.